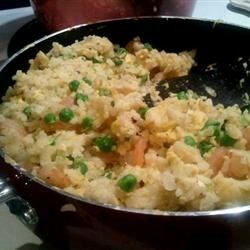 "This economical main dish fried rice recipe uses bacon or SPAM®." Cook bacon in a skillet over medium-high heat until crisp. Stir in the garlic, green onions, and carrots; cook for 2 minutes. Add snow peas; cook for 2 more minutes. Stir in the cooked rice, a cup at a time, coating well with the grease. Cook and stir until the rice is hot, then sprinkle with soy sauce. Tasty takeout favorite is better made fresh! I gave this recipe three stars because it was just ok. I used bacon bits and had a weird flavor. I will use this recipe again and make a few changes! It is also very common to use frozen mixed vegetables. Top with several dashes of Tabasco and a fried egg.